Brand new Archives are here! We’re constantly working on the Agent app so it has more powerful features but stays easy to use. Today, we shipped redesigned Archives. The new design is easier to work with. Clear division between a list of archived chats, chat feed and details, makes you know what is what immediately. You can see all chats with a particular customer with one click. The old filters like Agents, Groups, Tags, Sales, etc. are still there. Now, you can set them to return results that meet one or more conditions. 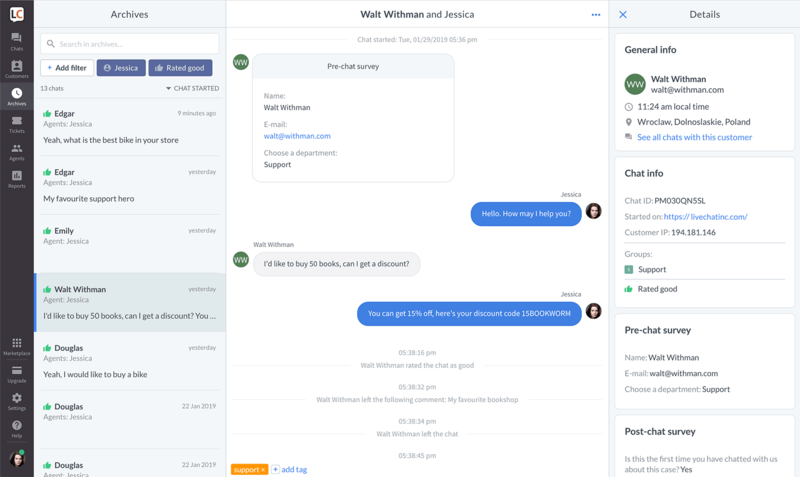 For example, all chats that were tagged with either Support or Sales tags. Click here to learn more about Archives, and don’t forget to share your feedback on our official LiveChat Community forum!